The northern half of Death Valley National Park is much less visited than the Badwater - Furnace Creek area further south since there are fewer points of interest and not many facilities. 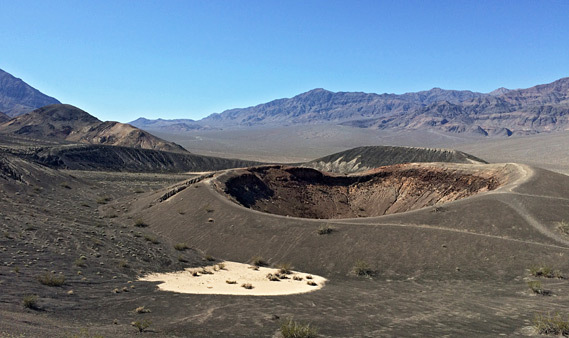 From the main road junction near Stovepipe Wells it is 38 miles along CA 190 to Ubehebe Crater, a deep depression formed by volcanic eruptions about 2,000 years ago. The long drive (on the 'North Highway') serves to emphasise just how much land is contained within the National Park, passing a seemingly never-ending sequence of dark, twisted, rocky hills on one side and vast sandy plains on the other. The only signposted feature en route is Titus Canyon - a steep limestone gorge with a rough, rocky track (sometimes partly closed in winter) running through it towards road 374. Apart from a short section leading to the canyon entrance, the route is one-way; the direction of travel is east to west. One location well-worth visiting is Mesquite Flat, just north of Stovepipe Wells village - here is found the largest collection of sand dunes in the valley. They can be explored on foot or by driving along an unpaved road that crosses the southeast corner, though this has been closed in recent years. The colors and contours are especially spectacular at sunrise or sunset, and when seen from along entrance road 374, which is high enough for a good overall perspective view. 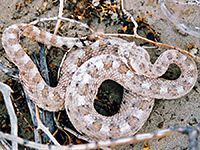 There are plenty of active lizards in the dunes including the fast running zebra tailed species as well as many sidewinder rattlesnakes which are primarily nocturnal and spend most of the daylight hours hiding from the hot sun. 35 miles to the north along the main park drive, an unpaved track branches off the paved side road to Ubehebe Crater, leading to the northernmost reaches of Death Valley, where the land begins to rise steeply. The track climbs to over 1,600 meters across the Last Chance Mountains, a remote area that became part of the National Park following the boundary extension in 1995. 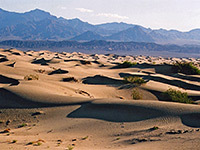 Nearby, in the adjacent Eureka Valley, the Eureka Sand Dunes rise to 700 feet, the highest in the park, and comparable in size to the Great Sand Dunes of Colorado. The valley is completely enclosed by mountains and has no outlet, so the sand continues to accumulate - the dunes were formerly designated a National Natural Landmark, but they remain little visited due to their isolated location and the poor quality of the approach roads. 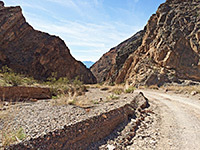 The northern entrance road to Death Valley (NV 267) climbs up Grapevine Canyon shortly before Ubehebe Crater. Along here, explorer and mineral prospector Walter E. Scott built a replica Spanish manor house in 1922, now known as Scotty's Castle and owned by the National Park Service. The relatively high elevation (3,000 feet) made this quite a comfortable place to live, and nearby springs provided a reliable year-round water supply. Today, there is a petrol station, a restaurant and an expensive hotel. Tours of the castle are available, and Scotty's tomb can be visited, on a hill behind the buildings. All this area is closed until 2020, however, due to flash flood damage. 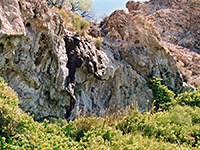 The Grapevine Springs provide a year round water source from a collection of streams, pools, cascades and springs, the lower portion of which stretch several hundred feet along the cliffs that line the valley a mile northwest of the entrance station near Scotty's Castle. Some of the water is piped away by the NPS and the site is not an official attraction but is easily reached, either by walking along the access track or hiking half a mile across the desert from the park road. 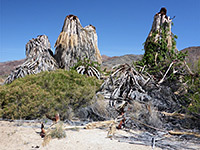 The streams flowing from the springs are lined by densely growing bushes and reeds between which the ground is more open, though shaded by large cottonwood trees that provide shelter for various ruined wooden shacks and modern NPS buildings. The most interesting area is where the waters emerge from the cliffs, amidst layered travertine formations, colorful mineralised rocks, palm trees and barrel cacti. Above the cliffs, the riparian area extends for 2 miles, explorable by off-trail hiking; the most interesting section is towards the north end. Beyond Scotty's Castle, a few miles into Nevada on the north side of the road is the Bonnie Claire Flat, a dried lake bed that was featured in the film Delusion (1991). The road is mostly unfenced and it is easy to drive onto the mud flats, to rest or to camp. This is one of the most eerie and evocative places I have ever spent the night in the US. 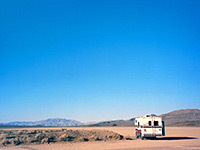 In the baking heat of an August evening, only 2 other cars passed by in five hours after sundown; the sky was completely clear with innumerable brilliant stars yet a fierce, hot wind blew for most of the night, often rocking the RV by an alarming degree. The sense of isolation was heightened by the stark, black outlines of the barren hills that seemed to enclose the lake flats in all directions.